← Marion Le Pen: Fight Islamism! Here’s the California delegation at the Democrat convention. 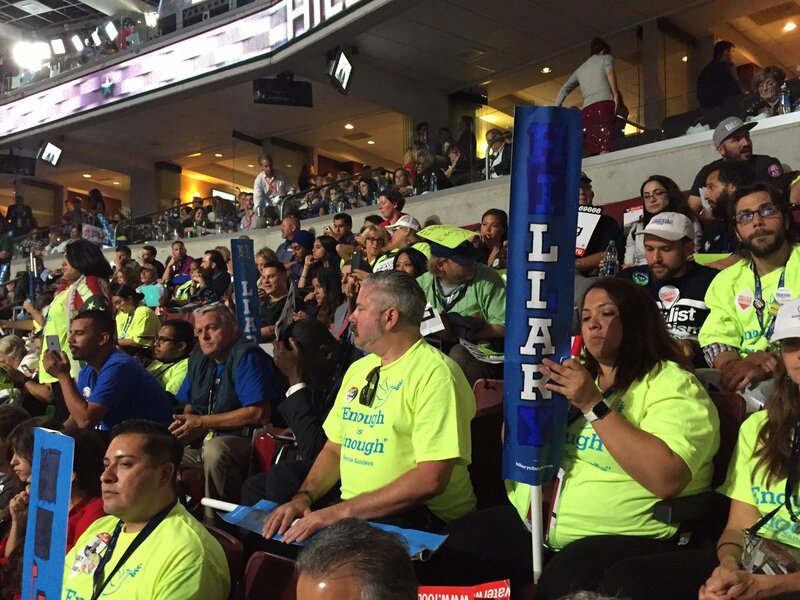 The convention rulers turned off the lights in their section whenever they raised their “liar” signs so they wouldn’t be seen on television. They had to hire people to fill the seats the Bernie supporters left. And the place was still emptier than shown on TV. Even those who like her must be put off by her repulsive expressions. And many don’t. UPDATE: Slick Willie used her speech to catch up on some sleep. Heh. We already knew he was bored with her. This entry was posted in The Culture, The Ruling Class and tagged even Democrats can't stand her, Hillary's weird expressions, Liar signs in the California delegation. Bookmark the permalink. Heh. Good practice for folks who think socialism is the answer to their problems.